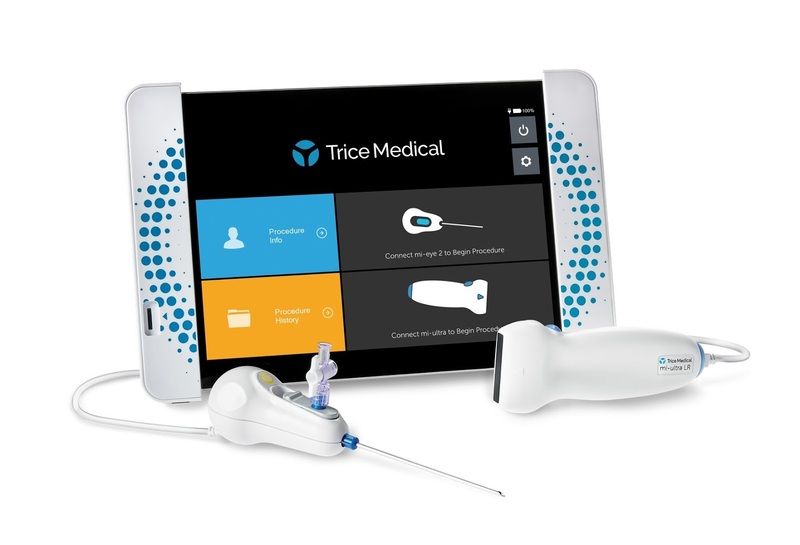 U.S. based Trice Medical, Inc. announced today the launch of its latest product, mi-ultra™, a high powered 15mHz handheld ultrasound transducer. The mi-ultra™ is enabled by the same platform technology that Trice's flagship product, mi-eye 2®, operates on, the mi-tablet. The mi-ultra™, which comes in both convex and linear offerings, has been optimized for Muscular Skeletal (MSK) applications. The addition of this technology to Trice's Dynamic Imaging Platform will enable orthopedic practices to provide a full suite of MSK imaging at the first point of care. The ability to provide a dynamic evaluation for patients, as opposed to static systems like MRI and X-Ray, has never been easier for orthopedic offices with this all-in-one portable system. Dr. Don Buford, orthopedic surgeon and founder of the Dallas PRP and Stem Cell Institute, said, "The mi-ultra™ is a combination of the first MSK ultrasound system with sufficient image quality and reliability for all diagnostic and procedure indications with the first tablet based disposable office needle arthroscopy platform. Now, every orthopedic clinician can have a single portable tablet for imaging intra-articular and extra-articular anatomy for diagnosis and procedures. This is a truly revolutionary point of care imaging system and the only such platform available!" The early success of Trice Medical's mi-eye 2®, which was launched in the U.S. in 2017, has captured the attention of medical professionals who are embracing the technology as a new diagnostic modality. After the first year of commercial launch, the mi-eye® is currently being used by over 300 institutions across the U.S. The disposable needle embedded with a wide-angle camera lens enables physicians to diagnose joint injuries right in their clinic; deliver biological under direct visualization; and provide their patients with immediate answers to the cause of their pain. "This is a truly disruptive technology for the orthopedic industry," said Mark Foster, President and CCO of Trice Medical. "Today's healthcare environment is asking for innovation in a cost-effective manner. Trice is proud to have combined an arthroscopy tower and a high-powered ultrasound system into one simple, portable tablet. The disposable mi-eye 2®camera is great to identify pathology within the joint and the mi-ultra is a perfect complement for guided injections or assessing soft tissue damage outside of the joint. We believe the system is a "must have" for every orthopedic practice."